When it comes to horror films inspired by actual events, most fans know that The Conjuring is based on the case files of Ed and Lorraine Warren and that Henry: Portrait of a Serial Killer was loosely inspired by the confessions of Henry Lee Lucas. But, there are plenty of other horror features that have taken their inspiration from actual events that aren’t as well recognized for doing so. With that in mind, we have put together some examples of films that you may be surprised to learn took their inspiration from actual events. Read on for our top picks. Some of them may just surprise you. One of the greatest slasher films of all time, A Nightmare on Elm Street follows a group of teenagers haunted (both literally and figuratively) by the sins of their parents. 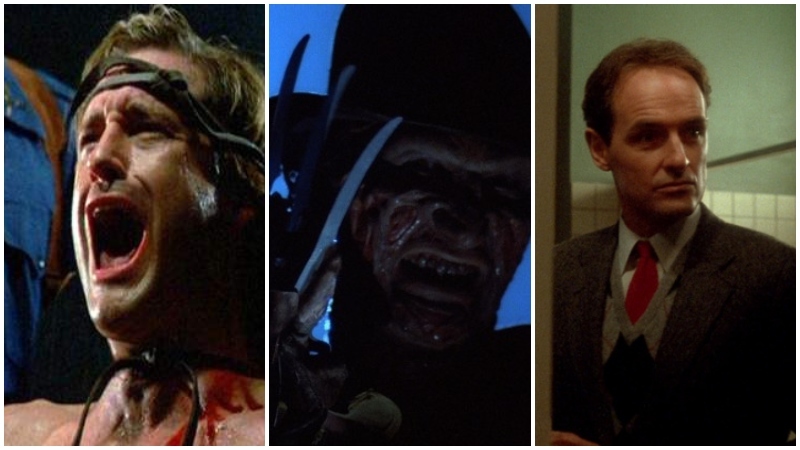 Naturally, the dream stalking Freddy Krueger is a work of the late Wes Craven’s imagination. However, the idea of dying from intense nightmares is very real. The auteur director got the idea for the film from an article he read detailing the story of a number of Asian refugees who are believed to have died of fright in a state of slumber. In some case, the victims were so afraid to sleep that they would stay awake for days at a time. And when they finally nodded off, they were believed to have literally died of fright. The condition is officially known as Sudden arrhythmic death syndrome. As crazy as it sounds, The Blob was inspired by actual events. On September 26, 1950, a pair of Philadelphia police officers witnessed an object floating in the air. When they went to investigate, they reported encountering a purple entity, roughly six feet in height, and filled with crystals. Upon reaching his hand inside, one of the policemen described the residue it left behind as “odorless” and “sticky”. After merely 30-minutes, the entire object disappeared, leaving little opportunity for further investigation. Speculation that the story was a hoax has long surrounded the initial report. But the eyewitness account went on to inspire the 1958 feature film about an alien life form that comes to earth and consumes everything around it, which was followed by a 1988 remake. The Exorcist is widely regarded as one of the scariest films of all time. It is a harrowing tale of possession and a young girl’s struggle to survive an encounter with supernatural. Based on William Peter Blatty’s novel of the same name, The Exorcist took some of its cues from the terrifying true story of Roland Doe. The name Roland Doe is a pseudonym, used to protect the young boy who was reportedly the victim of demonic possession. The author has revealed that, while attending Georgetown University, he saw an article depicting young Roland’s story and was thereby inspired to write the book. Blatty elaborates more on his inspiration for penning the novel in the book, William Peter Blatty On The Exorcist From Novel To Film. Blatty also penned the screenplay for the award winning feature film. While the names and many of the details of the case have been changed, The Stepfather is loosely based on the John List Murders. The 1987 film and its 2009 remake tell the story of a man who one day murders his family and starts his life over again. John List murdered his wife, their children, and his mother. He then relocated to Colorado where he started a new job and remarried as if nothing had ever happened. List was eventually apprehended after appearing on America’s Most Wanted nearly twenty years after killing his family. The 1988 David Cronenberg film about twin gynecologists who use their identical appearance to ‘share’ their female partners is actually based (in part) on a true story. The flick was loosely inspired by the case of Stewart and Cyril Marcus. The identical twin brothers were both New York City gynecologists and also shared an apartment. The pair was found deceased in Cyril’s apartment in July of 1975. The apparent cause of death was barbiturate overdose. The brothers had reportedly been in decline since being notified that their tenure at the hospital was being rescinded. This controversial film about a supernatural presence forcing a woman into a sexual relationship and the novel on which it is based are both inspired by a reported account of supernatural molestation made by Doris Bither in 1974. The authenticity of Bither’s claims have been challenged but paranormal investigator Barry Taff validated the woman’s reports, even going so far as to suggest that he had photographed the orbs that were attacking her. Doris Bither died in 1995. The 2011 film, The Rite tells the story of a seminary student who makes the journey to Italy to participate in a class on exorcism. The film is based on the 2009 book The Making of a Modern Exorcist and actually somewhat closely parallels the true-life events chronicled in the tome. Both the author of the book and Father Gary Thomas (the priest on whom the book is based) served as consultants on the production. Surprisingly, the crash course in exorcism depicted in the film is a real thing. The Texas Chain Saw Massacre is an interesting case. The film purports to be based on actual events, but the slaughter of a group of hippies in rural Texas, as it’s depicted in the film, never really happened. However, the late Tobe Hooper’s cinematic masterpiece did take inspiration from real life killer Ed Gein. There are several noteworthy similarities between Gein and TCM’s Leatherface. Among them are the use of human remains in the creation of furniture, the skin masks, and the depiction of cannibalism. Paco Plaza’s Spanish-language horror film, Veronica has been getting high praised from critics and fans alike since its US premier on Netflix. The film, which tells the story of a young woman who conjures a nasty demon with an Ouija Board, has been praised for its atmosphere and haunting visuals. The film’s cowriter and director, Paco Plaza (REC) was loosely inspired by the terrifying story of Estefania Gutierrez Lazaro. Lazaro is said to have taken ill after using an Ouija Board with classmates at her school. She experienced a series of health issues following the incident and died at a Madrid hospital in 1991. Lazaro’s family continued to report supernatural occurrences even after her passing. Sure, The Serpent and the Rainbow tells us its based on a true story. But, a lot of films falsely make that claim. How could such a sensational tale of zombies and voodoo be founded in fact? Well, it turns out that this one actually is. The picture tells the story of an anthropologist who journeys to Haiti to study the effects of a so-called zombie drug. The feature film is based on the book of the same name by author Wade Davis. The tome examines the story of Haitian native, Clairvius Narcisse. Narcisse recalls that he was admitted to a local hospital where he was eventually declared legally dead. After all of that, he was buried for three days and then exhumed and forced into slave labor. Medical professionals have extensively researched his account and believe his story to be genuine. It is thought that Narcisse was given a zombie drug concocted of a mixture of plants with stinging spines, human bones, and pufferfish. The tetrodotoxin, which is produced by pufferfish is believed to render those it is administered to (in the right dose) in a state indistinguishable from death. The post 10 Horror Movies Inspired by True Stories appeared first on ComingSoon.net.